In a large saucepan over medium heat, warm the oil. Add the carrots, onion, celery and celery leaves and sauté for 5 minutes. Stir in the water, stock and bread. Increase heat to high and bring to boil. 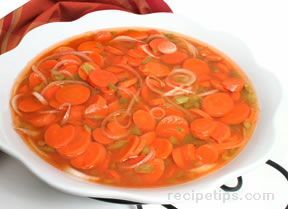 Reduce heat to low, cover and simmer until the carrots are tender, about 20 minutes. 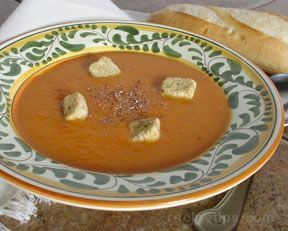 Transfer the soup, working in batches if necessary, to a blender or food processor and puree until smooth. 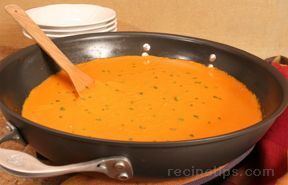 To serve hot, return the soup to the saucepan and stir in the milk and green onions. Reheat for a moment over low heat , not letting the soup boil, then stir in the ginger. Ladle the soup into individual bowls. To serve cold, pour into large bowl and stir in milk, green onions, and ginger. Cool to room temperature, then cover and refrigerate until chilled thoroughly, at least 4 hours or up to 3 days.